On a random side note, if you’re looking for a last minute stocking stuffer, I absolutely recommend the Oxo Good Grips Medium Cookie Scoop. 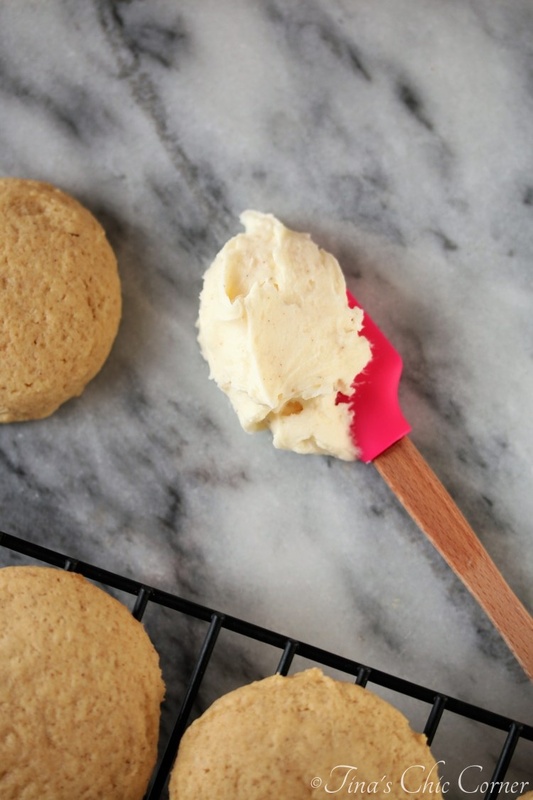 I have the small cookie scoop, too, but I use the medium size for most of my cookies. If you’re a procrastinator and looking for more than just a stocking stuffer then check out my post called “These Are A Few of My Favorite Things.” Three years ago I shared my favorite kitchen tools and the list is STILL my favorite today. That’s saying something. I checked all of the links and they still work, at least as of now. Soft cookies are my absolute favorite kind so these are my wheelhouse. Picture a thick and soft sugar cookie with lots of warm spices and that’s what’s going on here. There is eggnog in the cookie AND in the frosting too. 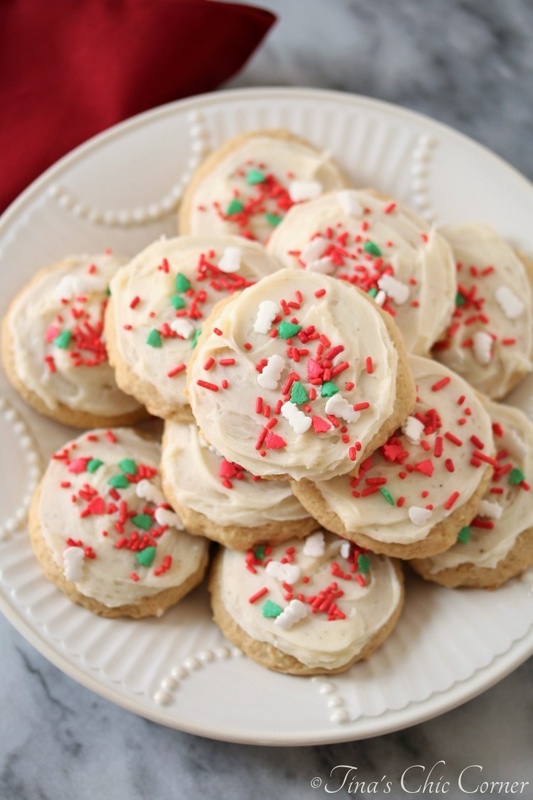 I think the frosting really makes these cookies “eggnog cookies” because that’s where you get most of the eggnog flavor. 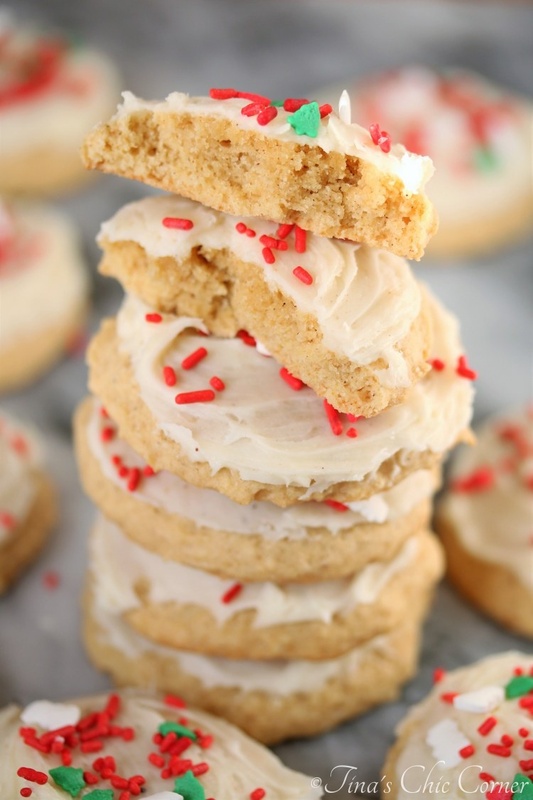 If you are obsessed with eggnog like I am then definitely don’t skip the frosting. Cookie baking season will soon be over and I’ll be back to blogging about all things that aren’t cookies once again. That’s a good thing because I’ll need a lot of salads after eating all these cookies. Preheat the oven to 350 degrees F. Line cookie sheets with parchment paper or silicon mats and set them aside. In a large bowl, whisk together the flour, baking powder, cinnamon, nutmeg, and salt. Set these dry ingredients aside. In another large bowl, cream together the butter, white sugar, and light brown sugar. Add the egg yolks, one at a time, and beat together. Add the vanilla extract and eggnog and beat together. Gradually add the dry ingredients into the bowl of wet ingredients and mix together until they’re just combined. 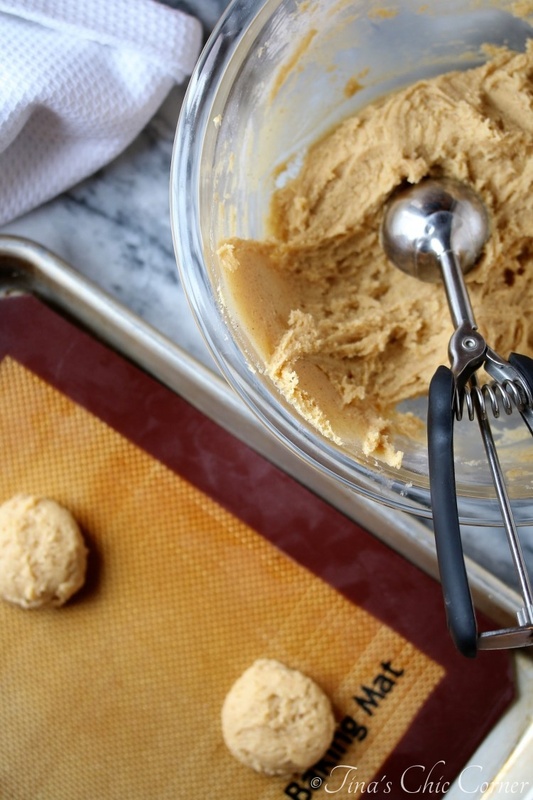 The cookie dough will be sticky. If you touch it with your finger gently a very tiny bit of dough will stick to your finger. Drop about 1 and 1/2 tablespoons of cookie dough per cookie onto the prepared cookie sheet, 6 cookies per cookie sheet. I used Oxo Good Grips Medium Cookie Scoop to help consistently scoop out the same amount of dough per cookie. Flatten each cookie dough ball slightly. I used the bottom of the dry measuring cup. Flattening will help give the tops a smooth look and it will also make the cookies wider because they do not spread much when they bake. Bake them for 10 to 12 minutes. I cooked mine for 12 minutes. Add in the powdered sugar, cinnamon, and nutmeg and beat everything together. Add in 2 tablespoons of eggnog and beat together. If you need more liquid then add the last tablespoon of eggnog and beat together. Your goal is to get the consistency of frosting. 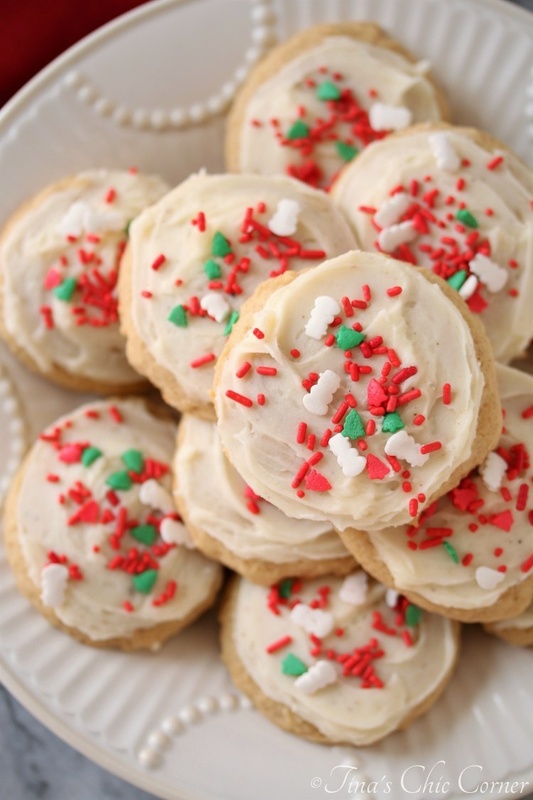 Make sure that the cookies are cooled completely otherwise your frosting will melt off. 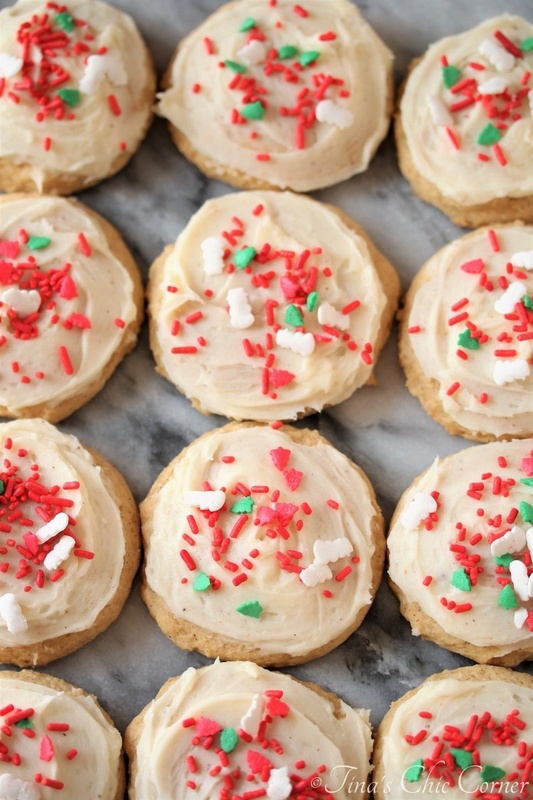 Spread the frosting on each cookie and sprinkle sprinkles on top. These sound yummy. I love egg nog so I will surely try them.